I’m not sure about you, but when I buy my replica watches online I want to make sure that everything is perfect. And when I say this I mean everything- the quality, the return policy, the customer services and even the price. All these very important details of the shopping process must be verified and certified by me. I need to know that I can count on the company’s reputability and on the quality of its products. Today, my attention was stolen by Mallwatch.uk. This online store tries to convince me that it carries some of the best replica watches you can find online. How true is this statement? Join me on this review and we shall soon find out! Unfortunately, the appearance of its website is not that great. Don’t get me wrong I wasn’t expecting to come across some fancy and complicated online site, but I would at least expect some originality in designing the e-shop. Ironic, isn’t it? Who would expect to find a pinch of originality at a fake watch merchant, right? Well, I for one like to know that the company I trust with my money is different than the countless other fake timepieces stores out there and believe me when I say that I have seen this website design on at least a dozen other sites. I find this rather disappointing. Still, the homepage feels very friendly and easy to use. It has a wide banner with just one image of a Diamonds Rolex Date-Just, a simple menu bar with 7 of the most popular brands and a couple of sponsored products in the center of the page. Even though the main menu has only 7 watch company names, the store carries many other brands. Once you click on one of the buttons a new page loads with a very long list of available brands in the left side of the screen. Here you will pretty much find all the important luxury watches brands, from Rolex, Omega, Jaeger Le-Coultre to Corum, Hublot and Ulysse Nardin. Every category is divided into sub-collections, but this just isn’t enough to make browsing easier as only the Rolex brand features over 5,000 products. My opinion is that an Advanced Search option would have been great on this e-store. By selecting the desired criteria you could have retrieved so easily the style of replica watch that you were looking to buy. I’m really not sure if Mallwatch.uk sells Swiss replica watches or only Japanese imitation timepieces. I have browsed at least 40 pages from its Rolex Daytona collection and I haven’t seen any Swiss ETA fakes. The ones I have noticed were all Asian movement clones that were priced between 65 GBP and 85 GBP. That’s not very expensive for an Asian automatic movement replica watch. It is the average price available on the market. It doesn’t take that much observation spirit or time to notice that the photos of these fake watches are copied from at least three different catalogs. This is very disappointing as it means that the company does not invest in its own product pictures. It prefers to take some random images from the Internet or some different suppliers and merge them together hoping that by doing this it will trick innocent shoppers into believing that what they see on the site is what they will receive. What I absolutely do not like about the payment policy of this online store is the fact that it only accepts Visa payments. It does not take any other type of card types or even alternative payment methods, like Western Union, Bank Wire or Money Gram. From my point of view, a company that accepts only Visa cards feels very suspicious and I just can’t force myself to trust such a merchant. Mallwatch.uk ships packages to any location in the world and it charges a flat rate charge of 20 GBP no matter of the destination country, total amount of the order or weight of the package. All orders are being dispatched with EMS, DHL or TNT and the estimated delivery time is about 7-10 business days. Of course, when the package is sent out you also receive an email with the tracking number so you can trace the shipment online at any time. The good news about this company is that it guarantees your satisfaction with a 7 days refund policy and a 14 days exchange warranty. The problem is that these policies are accompanied by numerous conditions. For instance, return reasons such as “the client does not like the product” or “the watch is different than displayed on the website” are not accepted. Basically, you can return the fake timepiece only if it is defective. Furthermore, there is no mention of a free repairs warranty. Of course, this company hasn’t heard of customer services otherwise it would have invested some time and effort into offering decent customer care to its potential customers. You can’t contact the store by phone or by chat. The only way of getting a hold of their agents is by sending a message through a Contact Form or at an unprofessional Gmail account and supposedly the customer service department is available 24/7. 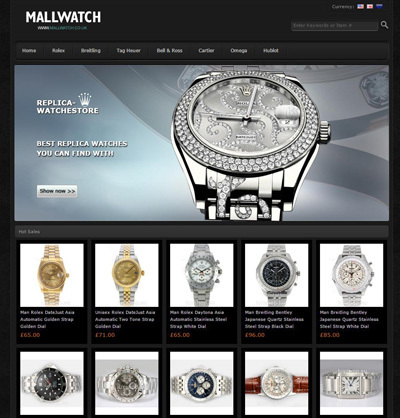 Mallwatch.uk is definitely the opposite of what I like to call a reputable and trustworthy replica watches online merchant. Indeed, it offers a very large collection of expensive brands fake timepieces, the prices are pretty low, it ships packages all around the world and it has a 7 days return policy, but it totally discourages me with its copied product pictures, limited payment options, poor customer service and unfair return conditions.